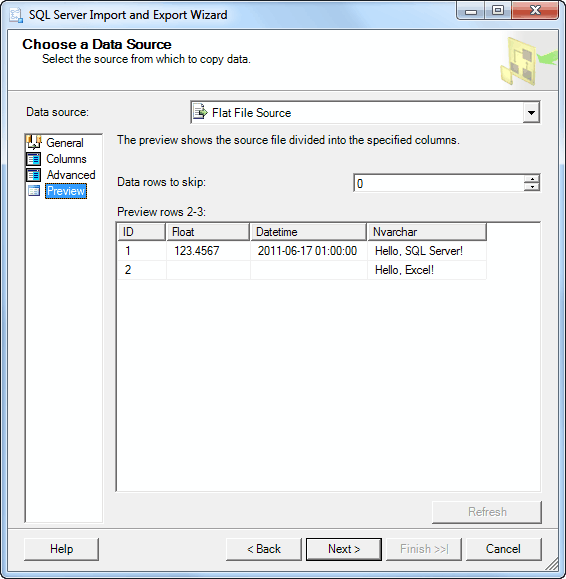 This article contains a complete example of Microsoft Excel and CSV data import to SQL Server using SQL Server Integration Services. You will find useful tips to get around difficulties and save your time. You will find a useful configurable command file to run import packages. You may download example files also. 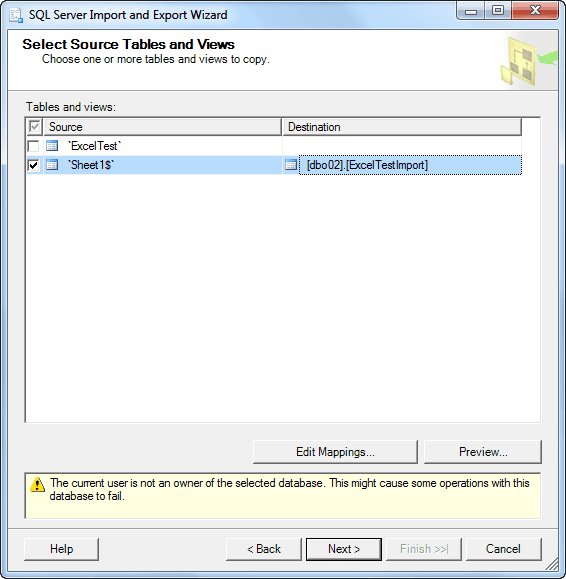 SQL Server Integration Services (SSIS) are powerful tools to import-export data between SQL Server/SQL Azure and other data sources including Microsoft Excel 2003/2007 and CSV files. 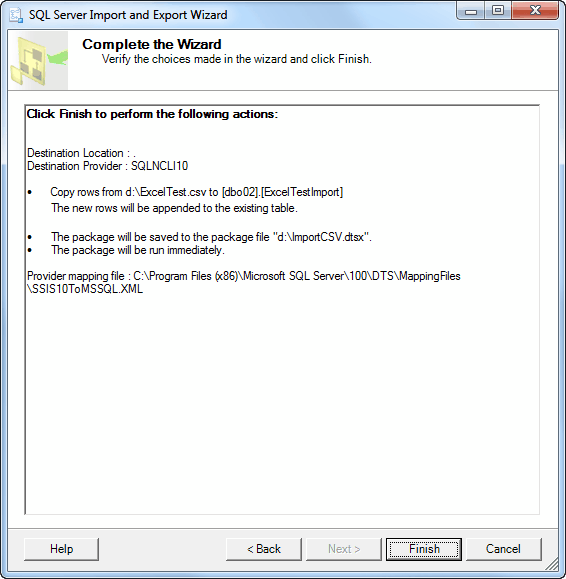 SQL Server Import-Export Wizard when you create a package. The dtexec command line utility. 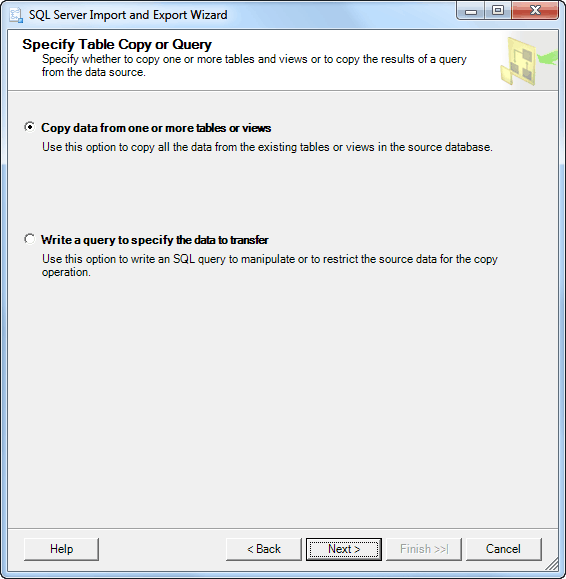 BIDS and SQL Agent are not avaiable in SQL Server Express Edition. 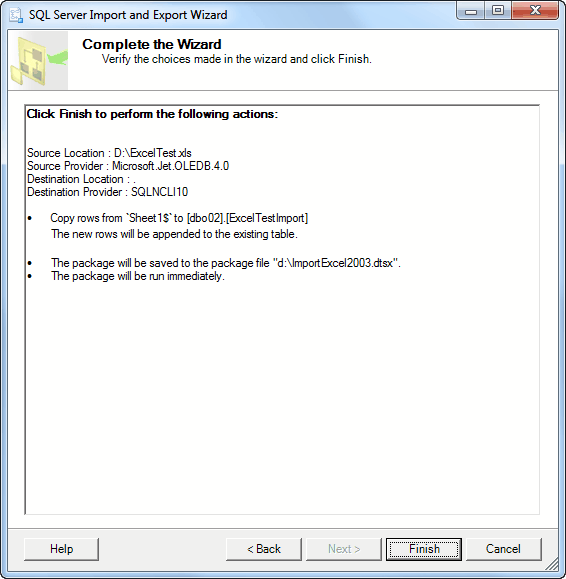 We will talk about package design using SQL Server Import-Export Wizard. 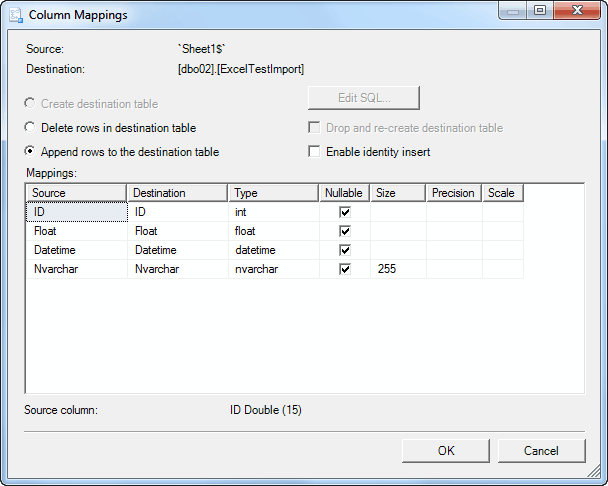 This feature covers import-export task with Microsoft Excel and CSV files. 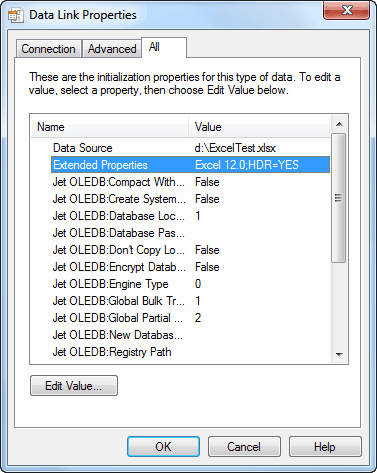 The Microsoft.Jet.OLEDB.4.0 Provider is used to import-export data with Microsoft Excel 97-2003 workbooks. It is named "Microsoft Excel" in the Import-Export Wizard. This provider is available by default on all Windows platform but has only the 32-bit version. So use the 32-bit version of dtexec utility and specify Run64BitRuntime=False in the Debug Options of SQL Server Business Intelligence Development Studio project properties. 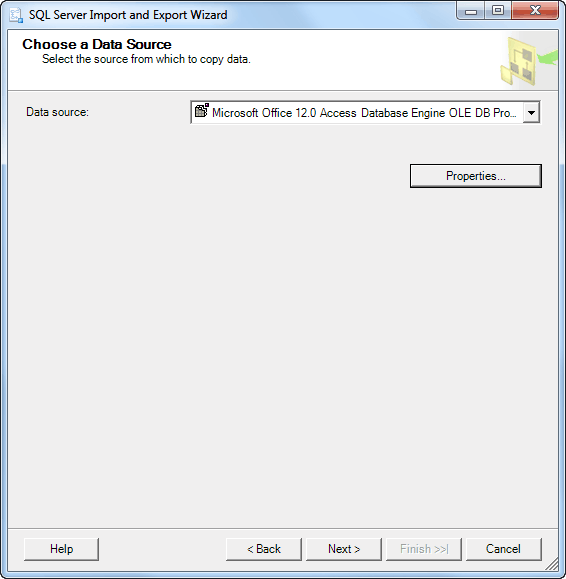 Microsoft Office 12.0 Access Database Engine OLE DB Provider is used to import-export data with Microsoft Excel 2007-2016 workbooks like *.xlsx, *.xlsm, *.xlb. Note that the platform of the provider should be the same as installed Microsoft Office platform. Also, you should use the appropriate platform versions of dtexec and the Import-Export Wizard. So if you have Microsoft Office x64 installed you should install the 64-bit provider and use the 64-bit Import-Export Wizard. 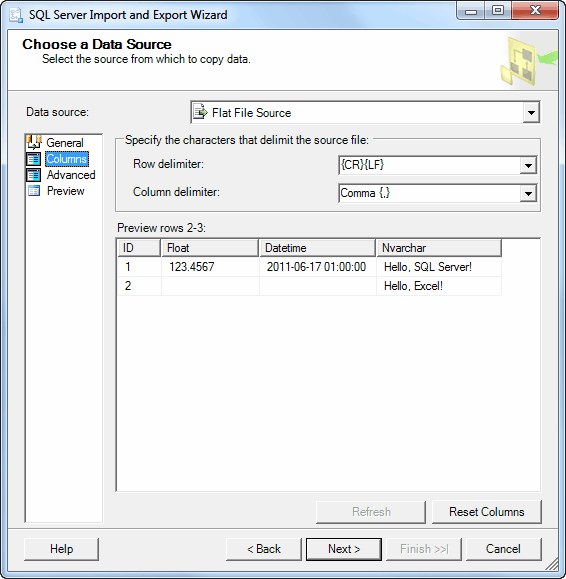 Note that SQL Server Management Studio and SQL Server Business Intelligence Development Studio run only the 32-bit Import-Export Wizard from a shell. 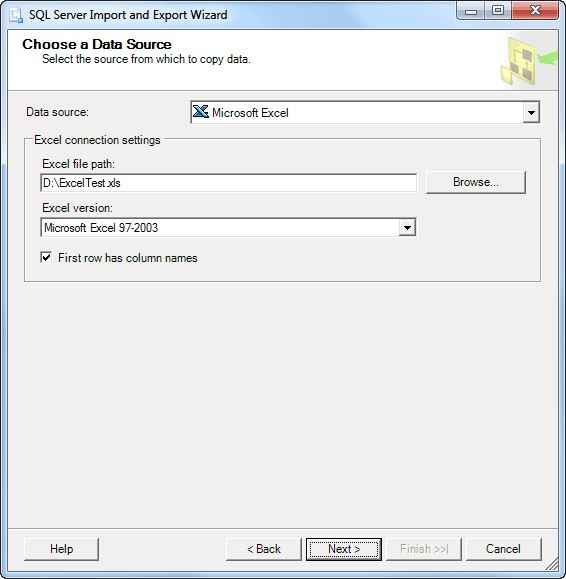 So use the "Import and Export Data (64-bit)" link from the SQL Server Start Menu group to run the wizard. To configure the provider fill in the Data Source value with Excel workbook path and Extended Properties with "Excel 12.0;HDR=YES" value for import to SQL Server from Excel and "Excel 12.0" for export from SQL Server to Excel. In the 32-bit Import-Export Wizard, you may use the "Microsoft Excel" data source with the "Microsoft Excel 2007" version to configure the ACE OLE DB Provider the same way as for Excel 2003 data source. The Flat File Source Provider is available by default and has the 32-bit and 64-bit versions. Run from SQL Server group in the Start Menu. 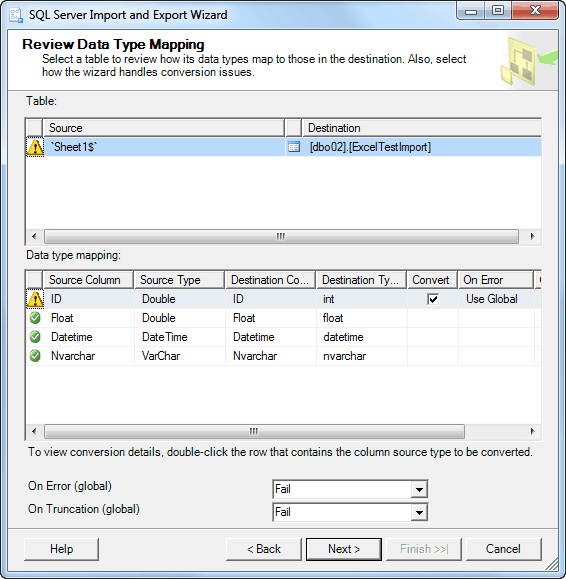 Run from SQL Server Management Studio (Object Explorer, Database, Tasks, Export Data...). 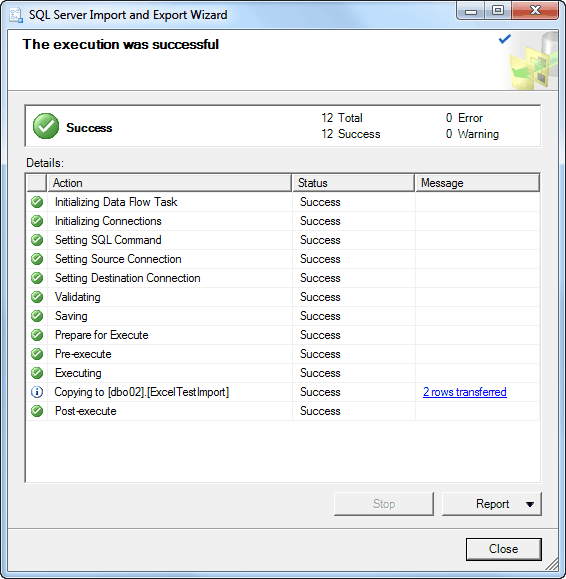 Run from SQL Server Business Intelligence Development Studio (Solution Explorer, SSIS Packages, SSIS Import and Export Wizard...). Only the first way allows running the 64-bit version of the Wizard that is required for the 64-bit ACE OLE DB Provider. On this step, you can use a production path to a data source or a temporary development path. In the last case, you can specify the path at runtime. In this example drive d: is used as a path directory. For importing from Excel 2003 workbooks, select Microsoft Excel as Data source and Microsoft Excel 97/2003 as Excel version. For importing from Excel 2007-2016 workbooks using the 32-bit ACE OLE DB Provider, select Microsoft Excel as Data source and Microsoft Excel 2007 as Excel version. For importing from Excel 2007-2016 workbooks using the 64-bit ACE OLE DB Provider, select Microsoft Office 12.0 Access Database Engine OLE DB Provider. Specify Extended Properties = "Excel 12.0;HDR=YES" and Data Source on the All tab. The good idea is to Test Connection on the Connection tab. Carefully specify the first three tabs, especially, the "Advanced" tab. Don&apos;t forget to check "Column names in the first data row." It is a good idea to use "Suggest Types..." button on the "Advanced" tab. Microsoft OLE DB Provider for SQL Server. .NET Framework Data Provider for SqlServer. The only .NET Framework Data Provider for SqlServer allows connecting to SQL Azure at design time. 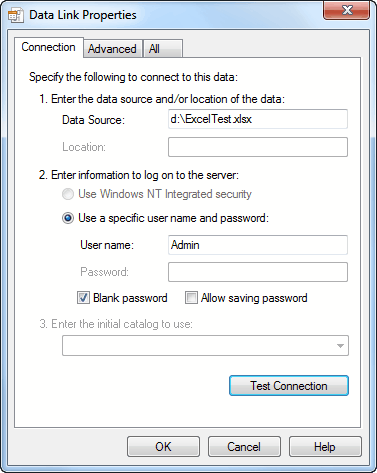 However, I have an error during the package run using dtexec utility: "ADO NET Destination has failed to acquire the connection". Moreover, I cannot find a solution. 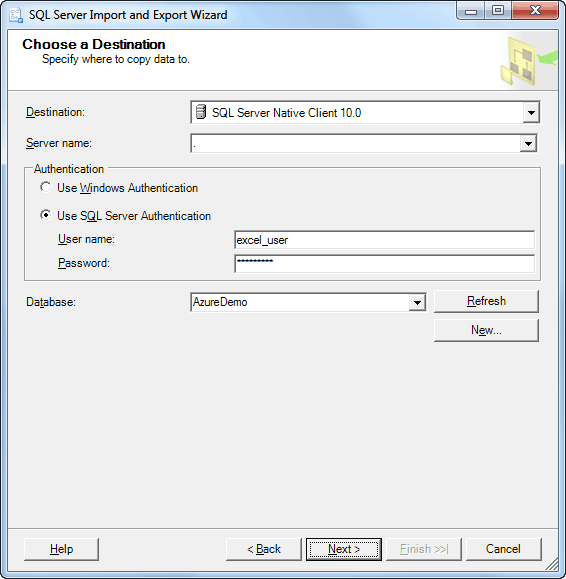 SQL Server Native Client is the best choice, therefore. For SQL Azure, we can make a design time connection to local SQL Server and then define a real connection string at runtime. The copying from a table is just enough for Excel/CSV import. You can see &apos;ExcelTest&apos; named range and &apos;Sheet1$&apos; sheet on the screenshot. Use named ranges if possible because users can add information on worksheets somewhere. The SQL Server Express Import-Export Wizard does not allow saving packages. Advantages of the storing to a file system are that you can edit SSIS packages using a text editor and distribute packages easily. Do not save sensitive data. Encrypt sensitive data with the user key. Encrypt sensitive data with a password. Encrypt all data with the user key. Encrypt all data with a password. 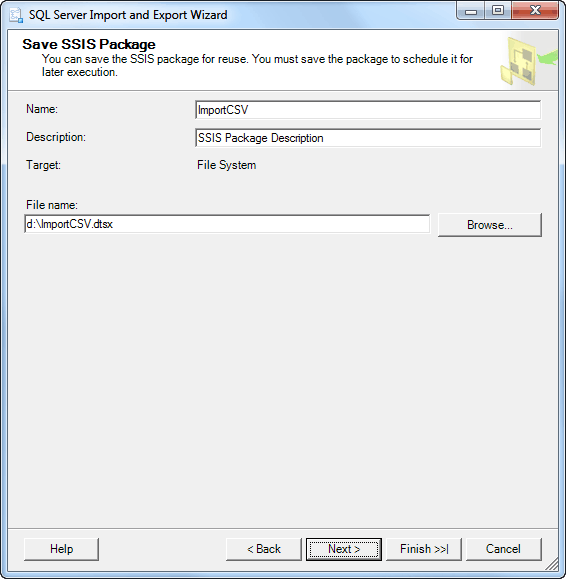 User key options restrict SSIS package run on other machines. Thus, you cannot distribute it easily. 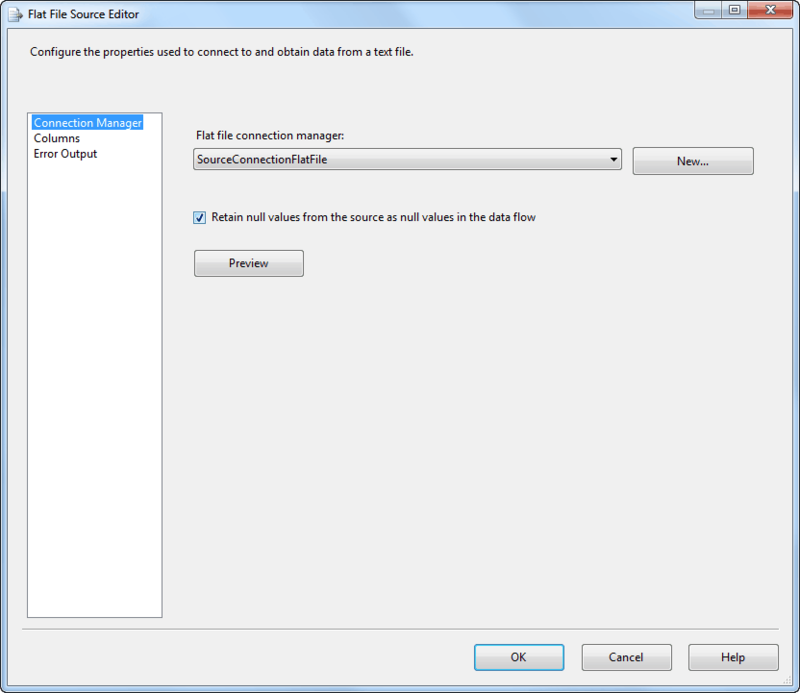 Encrypt all data options restricts access to an SSIS package text. Thus, you cannot edit it using a text editor. 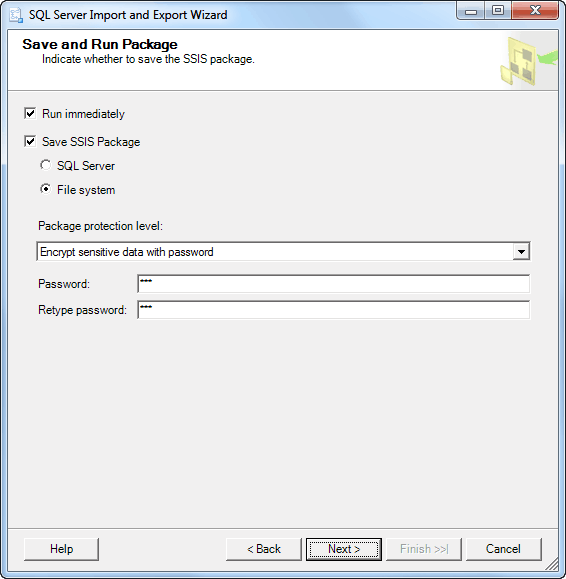 If an SSIS package does not contain sensitive data, you cannot run and debug a package using SQL Server Business Intelligence Development Studio. So, the best way for most cases is "Encrypt sensitive data with password". Password "123" is used in the example. Verify the choices and click "Finish" button. 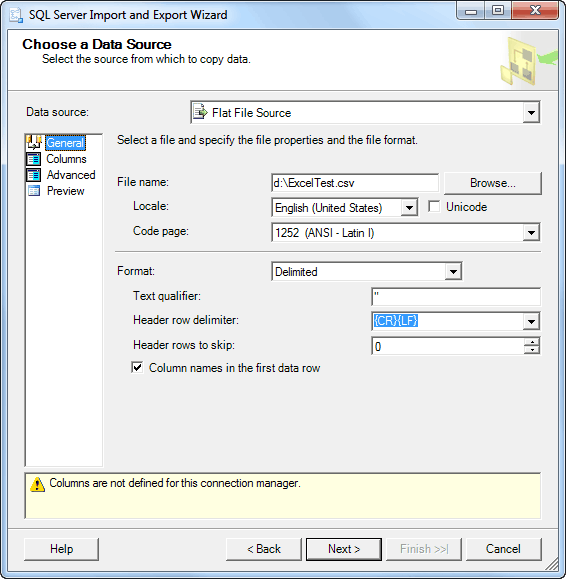 SSIS insert default values instead of null values. 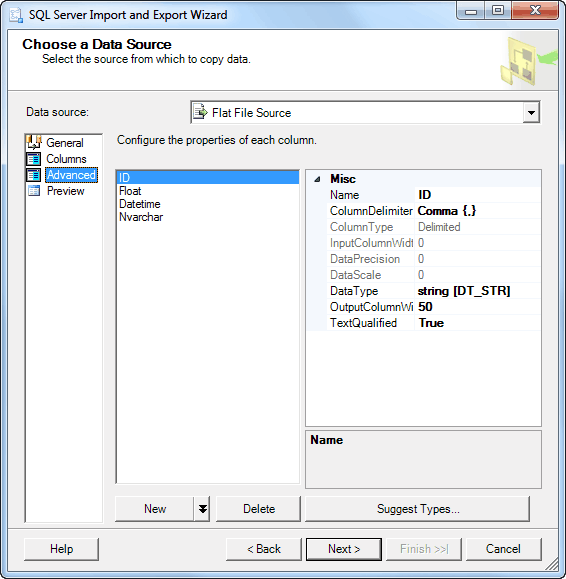 SSIS cannot convert float/double values without fixed scale from CSV files. For example, the imported Float value is not equal to source value 123.4567, and the Datetime value has datetime value 1753-01-01 00:00:00 (which can be 1899-12-30 00:00:00 if a date type specified). I know only the one solution for the float/double issue. It is to setup the decimal data type for CSV column using a scale that covers possible scales of column data. Change "RetainNulls" property to true in an SSIS package using a text editor. Open an SSIS package in SQL Server Business Intelligence Development Studio, activate the Data Flow tab, select the Flat File Source and set "RetainNull" to True in the property window. Alternatively, click "Edit..." in the Context Menu and check "Retain null values from the source as null values in the data flow." The results with null values. where a package password is from the "SaveandRunPackage" step of the Import-Export Wizard. On 64-bit computers, the 64-bit version of dtexec is used by default. Also, we can modify SSIS package paramaters using /set PropertyPath;Value option. /set \Package.Connections[DestinationConnectionOLEDB].Properties[ConnectionString];\""Data Source=%server%;User ID=%username%;Password=%password%;Initial Catalog=%database%;Provider=SQLNCLI10;Auto Translate=false;\""
/set \Package.Connections[SourceConnectionExcel].Properties[ConnectionString];\""Provider=Microsoft.Jet.OLEDB.4.0;Data Source=%file%;Extended Properties="Excel 8.0;HDR=YES";\""
/set \Package.Connections[SourceConnectionExcel].Properties[ConnectionString];\""Provider=Microsoft.ACE.OLEDB.12.0;Data Source=%file%;Extended Properties="Excel 12.0;HDR=YES"\""
The right technology to run SSIS packages is SQL Agent. However, we can use a simple and configurable batch file to run SSIS packages. destination=\Package.Connections[DestinationConnectionOLEDB].Properties[ConnectionString];\""Data Source=ko7h266q17.database.windows.net;User ID=excel_user@ko7h266q17;Password=ExSQL_#02;Initial Catalog=AzureDemo50;Provider=SQLNCLI10;Auto Translate=false;\""
set dtexec_x64="C:\Program Files\Microsoft SQL Server\100\DTS\Binn\DTExec.exe"
set dtexec_x86="C:\Program Files (x86)\Microsoft SQL Server\100\DTS\Binn\DTExec.exe"
if .%type%.==.jet. set source=\Package.Connections[SourceConnectionExcel].Properties[ConnectionString];\""Provider=Microsoft.Jet.OLEDB.4.0;Data Source=%file%;Extended Properties="Excel 8.0;HDR=YES";\""
if .%type%.==.ace. set source=\Package.Connections[SourceConnectionExcel].Properties[ConnectionString];\""Provider=Microsoft.ACE.OLEDB.12.0;Data Source=%file%;Extended Properties="Excel 12.0;HDR=YES"\""
The download package includes all these files. If you have SQL Server Standard or higher, you can use SQL Server Integration Services to import data from Microsoft Excel 2003-2016 or CSV files to SQL Server. Hope that the article tips help you to save your time.